Now you can verify all your 1D and 2D symbols with a portable handheld verifier from Webscan, the leader in high-performance barcode verification. Cut the cord — verify barcodes anywhere, anytime, while you are on-the-go. 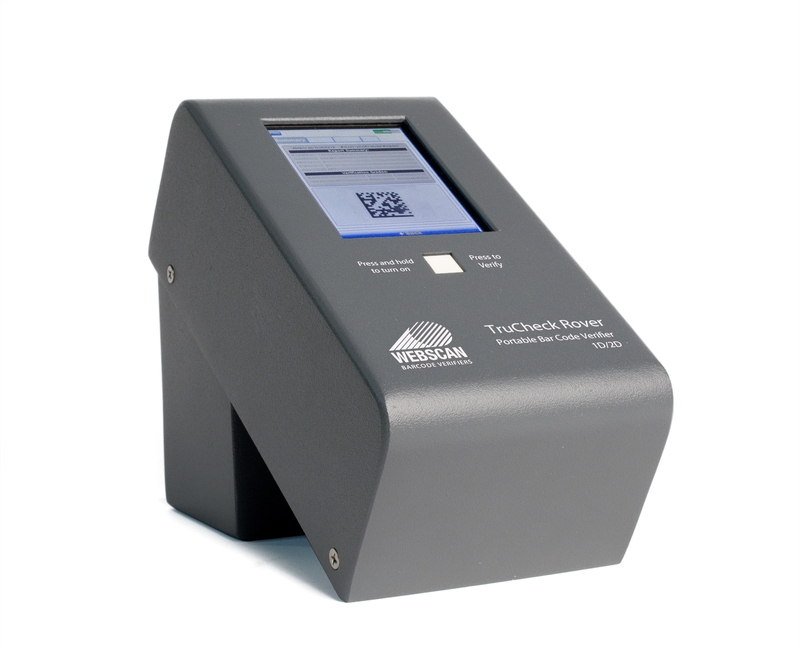 The TruCheck Rover™ from Webscan provides a fully integrated 2D CCD imager, integrated lighting, rechargeable battery and touchscreen for verification without any connection to a PC or other host computer. Two model versions are available to better suit your needs. The Rover Wide Angle has a field of view to fit codes up to three inches long. The standard model has a smaller field of view and fits codes up to two inches wide. Like all Webscan barcode verifiers, your results are calibrated and traceable to NIST standards. You are guaranteed the most accurate and repeatable verification results. The TruCheck Rover™ is battery powered for portability. With integrated processing and touch screen display, it is self-contained and easy to move around to where it is needed. No cables or cords. Its battery can even be recharged with an optional wireless cradle. The TruCheck Rover™ verifies linear (1D) and 2D matrix symbols in full accordance with industry standards, including ISO/IEC 15415, 15416 and AIM DPM (45Q illumination only). This is not a limited barcode assessment tool, but a full featured verifier. The design ensures that the image is calibrated and in focus when you place the bottom imaging surface of the Rover™ in contact with the barcode. Webscan’s broader product line incorporates portable and desktop software enabled hand-held and fixed mount versions. You can import results from the Rover™ to the TruCheck desktop software for archival and printing. Choose whichever version is right for you, without compromising ease-of-use, or accuracy. With Webscan you know your codes are being verified properly and your customers will recognize your commitment to barcode quality.